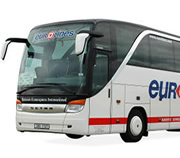 This section covers information on flights, trains, buses and coach travel to Prague. Once your journey is booked, use Prague Experience to arrange airport transfers, city centre hotels, and for advice on sightseeing, entertainment and the rest of your trip. International flights arrive at Prague Airport, officially known as Vaclav Havel Airport Prague. It has two passenger terminals and is located 17km outside the city. Wizz Air: Bari, Milan, Naples, Reykjavik, Venice. United: New York (June-October 2019). Use our airport transfers service to book a taxi from Prague Airport to your hotel (we also pick up from any Prague train or bus station). Alternatively, read our advice on travelling by public transport. The main train station is Praha hlavní nádraží. It is located in the city centre, 5 minutes walk from Wenceslas Square and 15 minutes from the Old Town Square. Metro station: Hlavní nádraží (line C). Tram stop: Hlavní nádraží. The second station is Nádraží Praha-Holešovice, situated just outside the centre. From here you can travel into the centre by tram, metro or taxi. Metro station: Nádraží Holešovice (line C). Tram stop: Nádraží Holešovice. 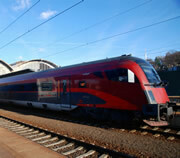 For travel from Prague, check train times and buy tickets at České dráhy (Czech Railways). The website is available in Czech, English and German (select 'en' or 'de' on the top right-hand corner of the page). Alternatively, purchase tickets in advance or on the day of travel from any Prague train station. Tickets are generally available to all national and international destinations up until the time of departure. International coach travellers arriving in Prague normally disembark at Praha Florenc Bus Station. This is 20-30 minutes walk from the city centre, so most visitors with luggage take public transport or book a taxi for onward travel to their hotel. The metro station is Florenc (lines B & C), which is two stops from both Muzeum metro station (top of Wenceslas Square) and Mustek metro station (bottom of Wenceslas Square and near the Old Town). The tram stop is Florenc. Motorists can drive into Prague fairly easily, although during rush hours there is heavy traffic congestion. Car parking is available all over the city: in public and private car parks, hotel car parks, and on the streets. Street parking by meter is possible in many areas. Parking meters permit stays of up to six hours during the day, or overnight. The roads off Wenceslas Square are amongst the most accessible, for example Washingtonova street near the National Museum - map. 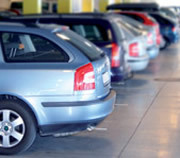 To ensure your vehicle is guarded, which is advisable overnight, use a car park. Wilsonova 6. Tel: +420 224 210 957. 40 CZK per hour. 650 CZK per day. located on Wilsonova, just before the corner with Washingtonova. Tel: +420 602 506 091. 60 CZK per hour. 1440 CZK per day. -Garaze Opletalova (near Wenceslas Square): Opletalova 9. Tel: +420 224 210 879. 770 CZK per day. -Parking Rudolfinum (Old Town): Alsovo nábřeží 12. Tel: +420 222 328 687. 660 CZK per day. -Millennium Plaza (Republic Square): V Celnici 10. Tel: +420 221 033 080. 600 CZK per day. -Palladium Shopping Centre (Republic Square): Namesti republiky 1. Tel: +420 225 770 310. 700 CZK per day. -National Theatre: Ostrovni 1. Tel: +420 224 901 443. 720 CZK per day. -Hotel InterContinental (Old Town): náměstí Curieovych 5. Tel: +420 606 253 093. 1000 CZK per day. Our public transport information has information on how to travel around Prague. - Book flights as far in advance of travel as possible. - The most expensive days to fly are usually Friday and Sunday. If possible, book at least one flight on another day. - The cheapest days to fly are usually Tuesday, Wednesday and Saturday.